Responsible for the arrest of Timothy Leary in Duchess County, NY; later in life the two went on the lecture circuit together. 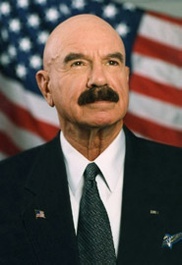 G. Gordon Liddy, Will: The Autobiography of G. Gordon Liddy (1991), page 139: "My agnosticism is a poor substitute for the faith I no longer have to give to my children. It's sad to realize those [Roman Catholic] rituals no longer exist to be passed on; like the scent of burning leaves in autumn, they, too, have been banned and are gone with the wind." We conclude from that passage that he is no longer a Roman Catholic. But despite his admission of agnosticism, in other parts of his autobiography he does admit to a belief in a higher being. Page 54: "And there would even come a day when I did not fear God either."